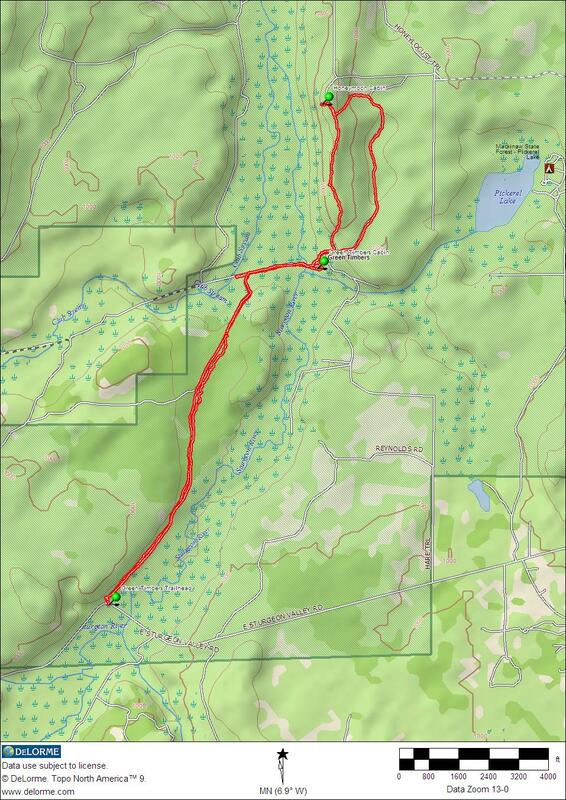 Green Timbers is a 6,388 acre tract that was adopted as part of the Pigeon River Country State Forest in 1982, and is closed to all motor vehicles, including snowmobiles. Here’s a link to Detailed Map of Green Timbers. Green Timbers, so named in 1942 by Don McLouth of McLouth Steel, was developed and used as a hunting and fishing resort. Prior to the McLouth ownership, the southeastern portion was used as a recreational retreat by Titus Glen Phillips, while the north portion was owned by Cornwall Lumber Company. The land was extensively logged, burned, and then grazed by both sheep and cattle prior to the 1958′s when McLouth purchased the property. The first thing you should know about Green Timbers is nothing is marked, there are no signs, other than the ones that say no motorized vehicles along the borders. There isn’t even a sign for the parking lot at the trailhead. Fortunately I can remember back to the large arched sign that used to be there when it was still in private ownership. It is about seven miles east of Vanderbilt. If you are looking for it, it is on the west side of the Sturgeon River on the north side of Sturgeon Valley Road, right where it curves to go over the Sturgeon. The stone walls at the entrance are still there. 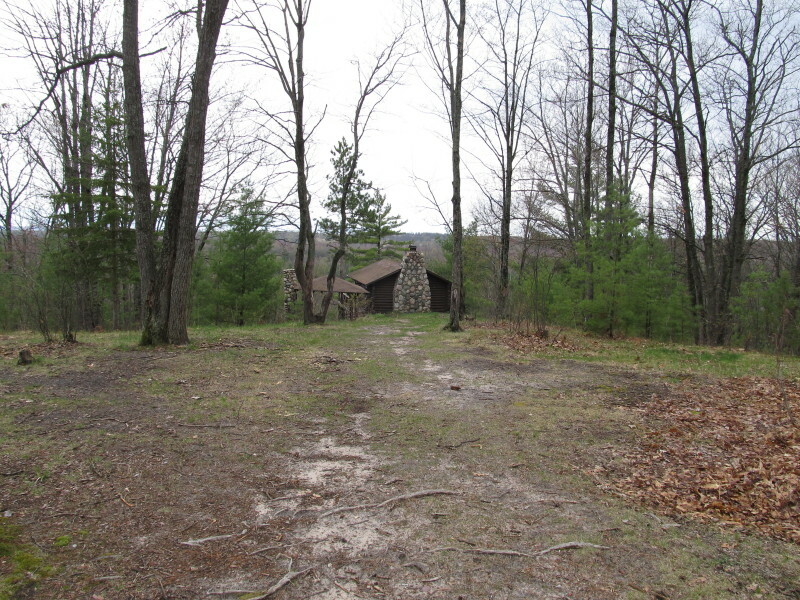 Also still on the property are two of the cabins that were used when the it was still a hunting and fishing resort. For how long, I am not sure, for the local kids are obviously using both of the cabins as party places. The DNR is leaving them for now for use as shelters for people hiking, snow shoeing, or cross-country skiing. The trail starts at the Sturgeon Valley Road trailhead and heads basically north for just less than 2 1/2 miles until you get to the first cabin, called the Green Timbers Cabin. The trail is an old two-track, easy to follow and easy to hike, with no hills at all to speak of. The forest is mixed second-growth pine for the most part along this section of the trail. You’ll know when you are about to get to the cabin when the trail makes a sharp turn to the right. If you go left for a few hundred feet, you’ll come to the Club Stream, so named because it flows through two of the old hunting clubs that used to be there, one of which is now Green Timbers. Club Stream is also an excellent trout stream. When you make the turn to the right, you will see the bridge over the Sturgeon River just ahead of you. The cabin will come into view as you cross the bridge, and it will be easy to see why they chose to build a cabin on this spot. it is surrounded by big red pines, I don’t know if they are old growth pines or second-growth that have gotten that large, but it is a very pretty setting right along the river. 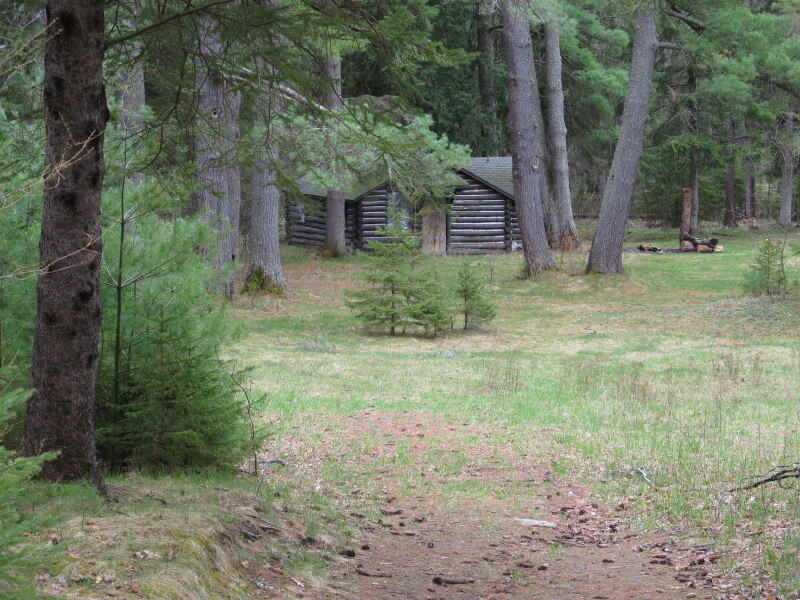 You are free to spend the night in the cabin, or anywhere with in Green Timbers, but you may want to obtain a free camping permit from the Pigeon River Country headquarters just in case. I can’t tell you if one is needed, but I would assume so, since they are required on all state forest lands. After you leave the Green Timbers Cabin, the trail winds more, and climbs up and over a ridge on the east side of the Sturgeon River. After you go over the ridge, the walking is easy again, through more open scrub and Jack Pines. The trail still heads to the north, and when it “T”s, go to the left, which is west, and climb up over the ridge again, it will be well worth the climb! 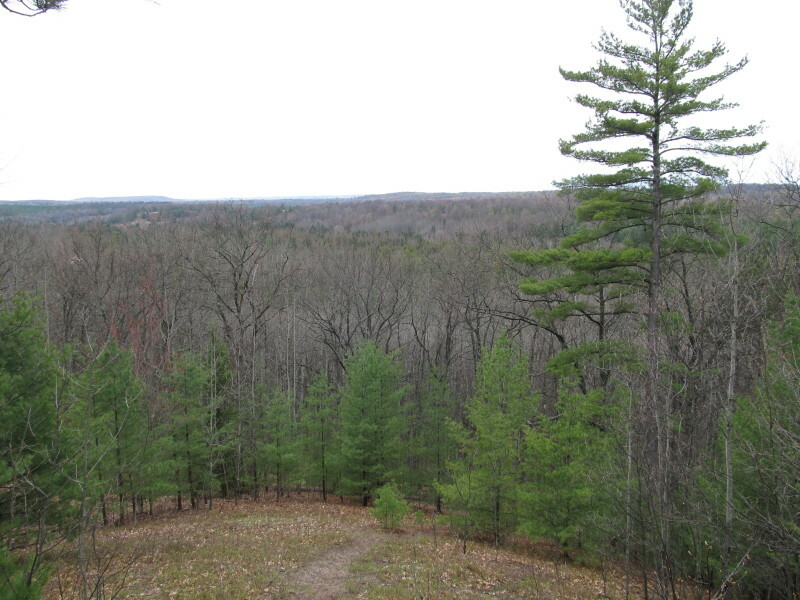 As you cross the top of the ridge, the Honeymoon Cabin will come into view, and the Sturgeon River Valley beyond it. These were taken in May, before the trees had leafed out, but I’ll try to go back in the fall when the foliage should be as spectacular as the view is. The distance from the Green Timbers cabin to the Honeymoon cabin is about 1 1/2 miles, making it 4 miles from the road, and about an 8 mile round trip. When I took the top of the ridge trail back, the distance that I came up with on my GPS unit was just over 7 miles total. For the return trip, there is a trail that runs right on top of the ridge and offers some great views on the way back. The trail isn’t marked, or shown on any maps that I have seen, but you’ll see it on the map I post at the end of this. It is easy to spot, it runs straight south along the top of the ridge. I wouldn’t suggest taking it up to the cabin, it isn’t as easy to find on the south end, and it would involve a very steep climb up the ridge. Don’t pay any attention to most of the roads on this map, as most of them aren’t there anymore. The DNR closed them long ago, and they are overgrown and impassable, and the DNR would fine you if they found you driving on them anyway. You can click on the map to get a larger, printable version. Nice write up. I hiked here back in 06. Found your site while researching this area for a return trip. Did you find the bunker? It is located near the Green Timbers cabin. I am not sure what it’s purpose was, but it at one time had electricity. It is concrete and built into the side of a hill. Thanks Nate! No, I’ve never found the bunker, I’m too busy chasing trout in the river to wander around in the woods very much. Thank you for adding more information. I’ve been going to the Pigeon River Country since the 1960’s, but knew nothing about Green Timbers until the state took ownership.